This past week, we introduced playlists to ClassHook. 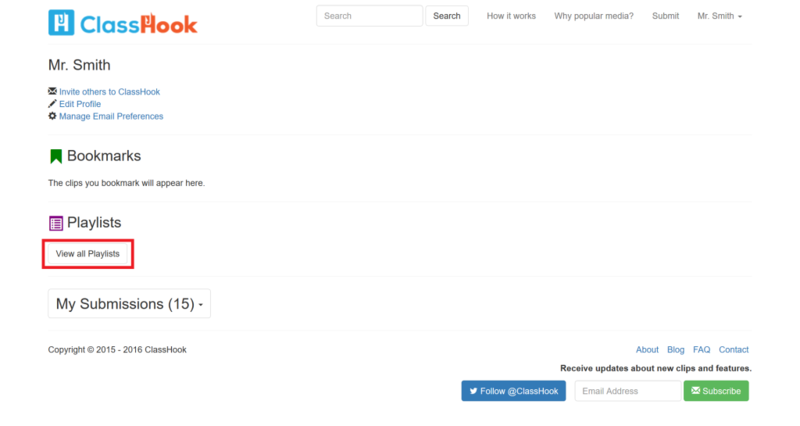 There is a similar feature on video hosting sites such as YouTube, so you will already be familiar with using them on ClassHook. You can get started on building your playlists right away. 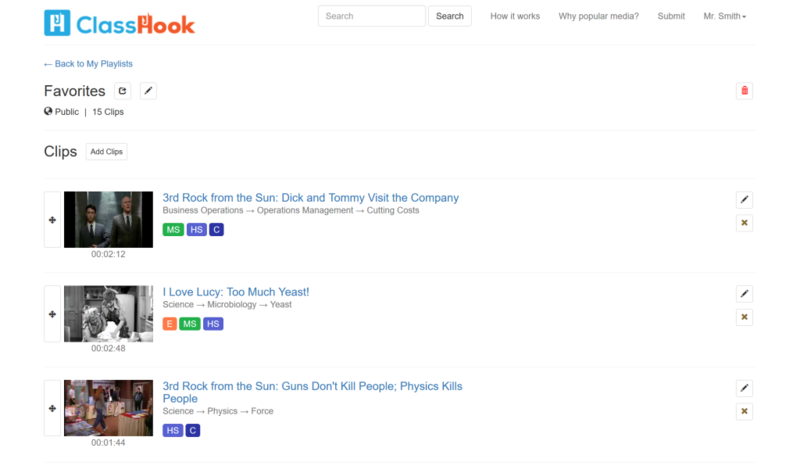 Why use playlists on ClassHook? Playlists allow you to group together clips for easy access and sharing. 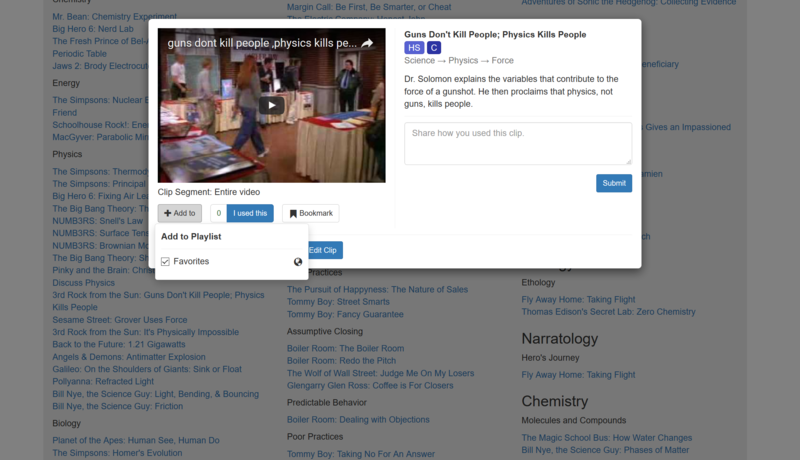 For example, you might want to group together clips that teach an entire Physics topic, or you might want to put funny clips together to better cope with less exciting lessons in the future. Playlists help you keep all those great clips organized in your own way! Why use ClassHook playlists over YouTube playlists? You can certainly use playlists on YouTube if you would like, but you would miss out on the valuable information that ClassHook provides, such as the appropriate age range, the relevant start/end times of clip segment, and more. Also, using playlists on ClassHook allows you to group together videos from multiple sources, not just YouTube! ClassHook’s library currently contains clips from sources such as YouTube, Dailymotion, Vimeo, and Hulu. How do I get started with playlists? Click on the “View all playlists” button to view your playlists. Here, you can manage your playlists and share them with others if you’ve set their privacy setting to public. Clicking on the name of the playlist will bring you to all of the clips in the playlist. I’ve organized some of my favorite clips into this one playlist so I can easily refer back to them. You can manage your playlists clips here by reordering them, deleting them, and adding notes to them. You can also add more clips to your playlist from this screen. Since this clip is already in my “Favorites” playlist, the checkbox is checked. If I uncheck it, as expected it will remove the clip from that playlist. I only have one playlist at the moment, but all of your playlists will be listed in the box. We are excited to bring you playlists and hope they will help you organize all of the clips that you find on ClassHook! How are you using playlists? Let us know in the comments, or send us a message! This entry was posted in New Features and tagged Group Clips, New Features, Playlists. Bookmark the permalink.